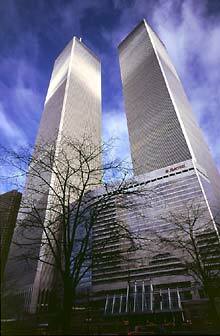 Editor's Note: Freelance photographer Ron J. Berard lives very close to the site of the World Trade Center in New York. He photographed and experienced the awful events of September 11 as a neighborhood resident. Our apartment building in Battery Park City was just two short blocks south of the World Trade Center. My daughter's school, PS 89, is about three blocks north of the World Trade Center. I walk her to school most every morning and walk right past the Towers around 8:15-8:30. On the morning of the 11th, my daughter had a dental appointment at 8:30 am just across the street from the north tower. The first plane (American Flight 11) tore into the north tower at 8:46 am and I (along with four to five other people in the waiting room) literally jumped off my chair when the explosion occurred. It shook the building we were in. We were on the second floor with no windows near, just a huge hallway and stairs. Soon afterwards, we were approached by police and security asking us to stay inside where it was safe as there was falling debris from the World Trade Center due to a small plane accidentally hitting it. We were also told the pilot may have suffered a heart attack. It just didn't ring true with some of us because in my mind, there would be no such thing as an accident occurring in the WTC. Not since what happened in 1993. Red flags went up and we started asking questions. Just then one of the patients' cell phones rang. It was his wife and she was watching TV and said the rumors were a missile had hit the twin tower, not a plane. The missile was launched from New Jersey and others were on the way. 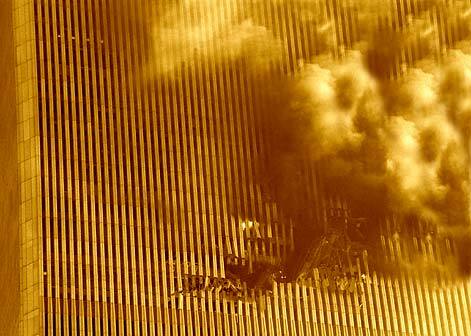 Probably governmental buildings, besides the WTC were being targeted. I knew there were two or more governmental agencies in the building my daughter and I were in. Photographs ©2001 Ron J. Berard. All Rights Reserved.